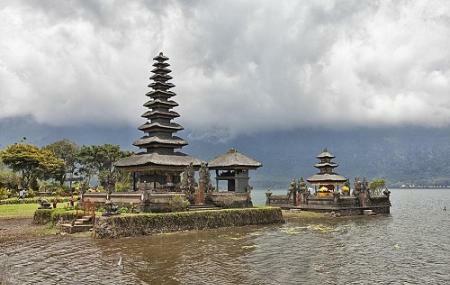 This temple complex in Bedugul on the edge of Lake Beratan is one of the most important on the island for Balinese Hindus. It’s also likely one of the most photographed temples on the island. Built in the 17th century by the Mengwi Kingdom to honor the Trinity of Brahma, Vishnu and Shiva and the Dewi Danu, the temple has four groups of shrines. The tiers of the Trinity’s individual shrines number, respectively, at 7, 11, and 3. The temple sits on a low lying portion of the lake, and occasionally this imparts the impression that the temple is floating on the lake. Supplementing this magical sight are the equally enchanting temple gardens on the grounds. Jukung outriggers and motorised boats can be hired near the temple if you want to ride out over the lake. Parasailing, fishing and jetskiing outfits are nearby too. People normally club together Taman Ayun Temple and Sekumpul Waterfall while planning their visit to Pura Ulun Danu Bratan.